Welcome to Zombieland, a place I tend to visit every Sunday, Monday and even sometimes Tuesday. Following a long run, my body and brain are in major lethargic mode, which isn’t always the happiest place to be. I can’t get enough sleep, my eyes are heavy, my mouth is in constant yawn mode, and my social skills are practically non existent. Last Monday, I think it was 3 o’clock before I willingly sparked my first casual conversation of the day, which is saying a lot. And today, it took everything I had to force myself out of bed, following an afternoon nap, my third of the day, to open up my computer and start concocting this blog (thank goodness for holiday Mondays!). Should I really expect anything less, though? I mean, I have just put my body through the grinder, pounding my feet up and down for three hours, depleting my oxygen stores, sweating out my electrolytes, and using up every ounce of energy to get me to the finish line. The fact that I can barely lift my head or muster up the energy to engage in conversation really shouldn’t come as much of a surprise, let alone a shocker, and yet it always does. But still, despite being a zombie, and as much as I’d prefer to be a bionic woman, it’s worth it. Good job ladies, thanks for being just as crazy as me! 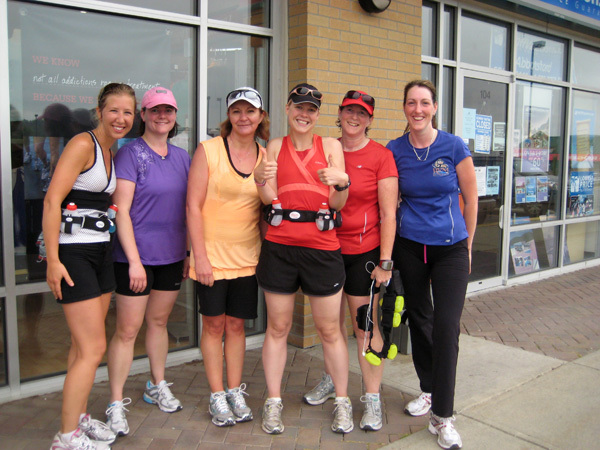 Blaine (Second from the left) and Carol (second from the right) are the only ones of the group who have run this kind of crazy mileage before! Given last week’s dramas, I was a little concerned going into the run, and was trying my best leading up to it not to think about or over analyze it for fear of further aggravating it. But, it seems, I had nothing to worry about. Aside from a bit of fatigue, and tender toes near the end of the run, I felt awesome. I went back to the instant oatmeal, half a banana and a smoothie for breakfast, which spiked my blood sugars – it is a lot of refined carbs going into the blood stream after all. And because it’s been awhile since I last ate the instant oatmeal, I was out of the loop of its effects. So when I saw that my blood sugars had risen almost five points just an hour and a half after eating, I panicked and gave myself a slight BG correction to counteract the high blood sugars. But here’s the thing, without fibre, instant oatmeal is just like gravity: what goes up must come down and when you add exercise to the mix, they come down a whole lot quicker. At about the 8 km mark, I tested my blood sugars and they were 3.5 – yikes! I popped five sugar tablets and for the first time ever, I turned my pump off. Sorry for the blur, I couldn't get my focus to work well with it that close to the camera. Given that I still had several kilometres to go, I was worried that my blood sugars would go low again. 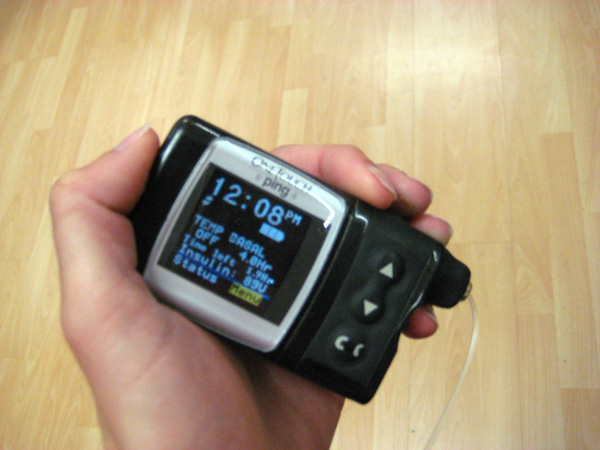 I’d heard of other pump users shutting their pumps off for exercise, but until yesterday, I didn’t like the idea of not having any insulin going into my system. Turns out, though, it was the right decision. At the 14 km mark, they were back up to 5.6, and post run, they were a perfect 5.5. Another right decision: pancakes! They were the most delicious, melt-in-your-mouth, perfect energy food at the 2:15 mark. I’d already gone through two GU gels and had had no ill effect from those, so when it was time for a third energy boost, I pulled out the maple syrup infused pancake, bit off three pieces, chewed as fast as I could (I only have a minute to do this) guzzled down a gulp of water and continued my run. I kept waiting for something bad, a cramping stomach, a nauseated throat, anything. But the only thing they did was had me wanting more – a great motivator to keep me going, knowing I had another waiting for me in the car. Yum! Oh, oh, oh, and another great thing happened on the run. When we stopped at one of the girls’ houses for a real washroom break, a huge peloton of cyclists started riding towards us, and I decided to throw Mario’s “Rules of the Wave” out the window and give them a full-on, two-handed wave. At first, it didn’t look as though they were gonna respond, but then they all started waving – and cheering!!! Granted I wasn’t on the bike when it happened, it still helped to restore my faith back into the cyclist. Now, I just got to get that while on the bike. And now, what you’ve all been waiting for. YESTERDAY’S SECOND DESSERT!!! Drumroll please … tada! 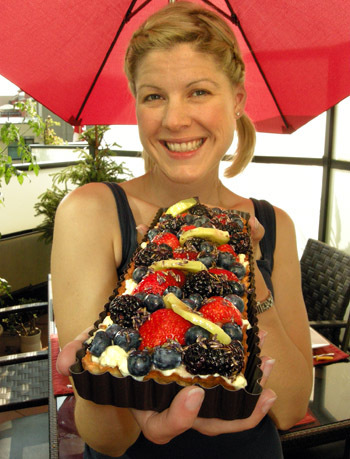 Summer fruit tart with lavender syrup! Every last crumb devoured! Yum! I have to add a comment about the pancake…for the brief second that I saw it it did look yummy. I don’t recall Katie asking if anyone else would like a bite but then again she was stuffing her mouth so she really couldn’t say anything. Recipe for the lovely summer tart? Looks scrumptious!! Way to go on your run Super-Katie! You are fantabulous! Have you got a recipe for the summer tart? Looks Yummy! Way to go on your long run! You are Super-Katie for sure! !